Welcome to kazoku_game, a community dedicated to the Spring 2013 Jdrama! For the once per season jdrama awards. 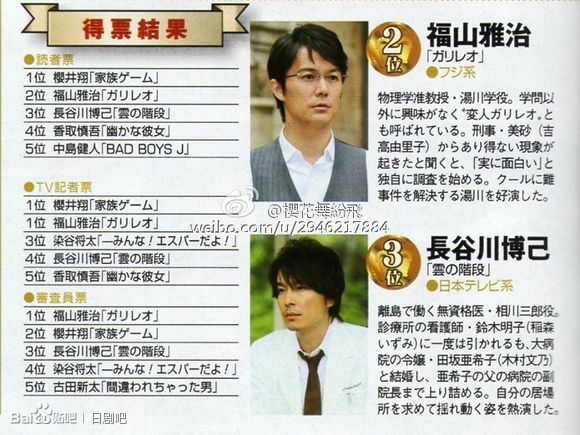 I only have Sho's pic and raintg & Kamiki's details here for now...but per producer's twit and other sources Kazoku game grabbed a whole lot of prizes :) Totally deserving I'd say. Per producer twi >< 6 out of 8 wins! The only thing I am kinda sad about is Suzuki not owning the supporting actress role, since she was so good. But I heard this part there's a lot of competition and in the end Yuriko stood out. I see~ that's so cool, excuse me but, what it's the entity who gave this award? 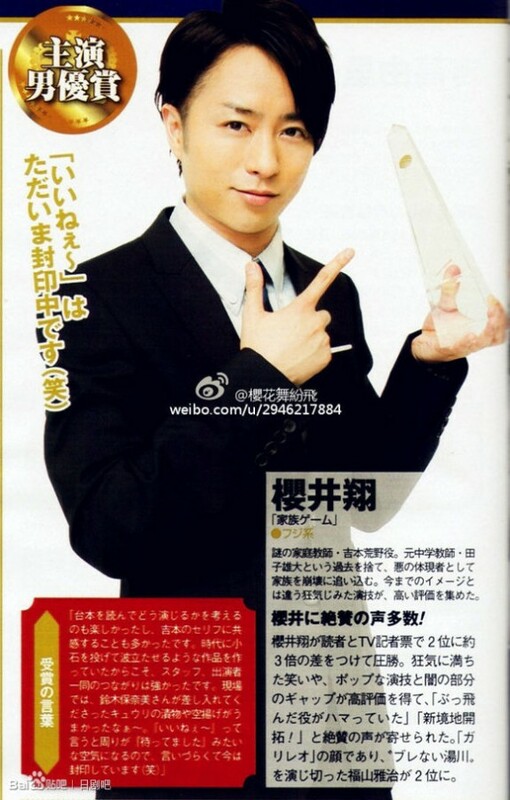 The entity who gave the award is The Television magazine. The results come from jury, tv journalists and magazine readers' votes. This is the 77th Drama Academy Awards for Japanese drama, awarded each drama season. But yeah, it's called the 77th Television Drama Academy Awards held by The Television Magazine. I wasn't able to make it clear in my original comment. Yes! Been waiting for this! Congratulations Kazoku Game! It's a pity the ratings weren't as high as this amazing dorama deserved, but whatever. Congratulations to Sho and the Kazoku Game team!!! 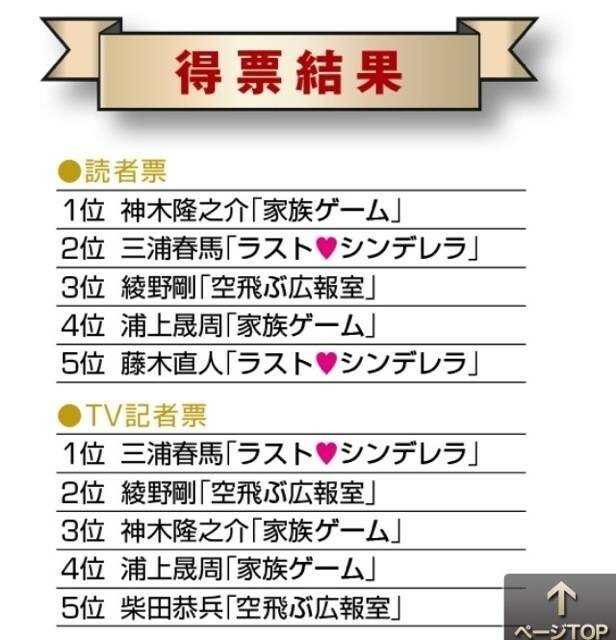 I'm also happy for Uragami, being able to be in the top 5 for supporting actor. Congrats to all winners esp Sho. great job,they all deserve to win. For a while I thought nor the drama nor Sho has a chance to win against Galileo, but it did, and I think this award is completely well deserved for both the story and the actors. yay. that's great. but really it's deserved :. 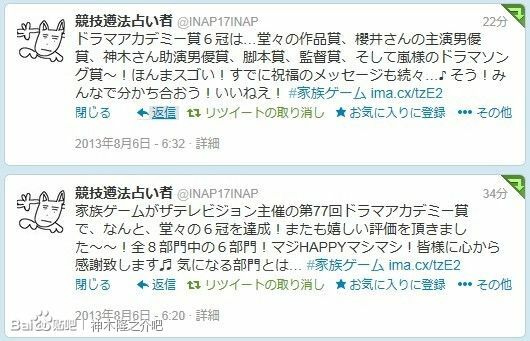 Omedeto, sho...^^ I'm so happy, but not surprise. Kazoku game really is the best drama. They deserve it. Omedetou to kazoku game cast and staff! sugoi!! kazoku game totally deserved it! when i watch the drama, i really want it to be an award winning one as its story line, casts & whatnot are very superb.